A French/Tunisian film full of social justice politics in a patriarchal world, Beauty and the Dogs hits hard because it’s so harrowing and so human. The picture unfolds in the real time-frame of a single evening, spanning across nine separate sequences that are all shot in long, uncut takes, making the drama of the film all the more effectively immediate and unpredictable. And while the story is undeveloped to the point of rightful scrutiny, there’s no denying that Beauty and the Dogs soars on the tremendous technical prowess of its brutal, brave narrative. The story might play checkers, but boy does the direction play chess. Beauty and the Dogs almost begins how most romantic comedies do, although with a serious and darker exterior. Mariam (Mariam Al Ferjani) attends a sanctioned college mixer party, catches the eyes of Youssef (Ghanem Zrelli) as he stands in the corner, they leave minutes later for a walk on the beach. Then the film cuts to Mariam sprinting down the street, crying as Youssef is in hot pursuit behind her. What happened between them? Is she trying to escape this man? The movie works so well to start because it doesn’t define things as black and white, and that tactic is employed even after the truth of the situation is revealed beyond little shadow of a doubt. Mariam was raped by two police officers. She knows it, and Al Ferjani’s stellar performance convinces us likewise. The only problem is that she must file an official police report in a system full of rabid male mutts. I knew nothing about this film heading in. Hadn’t seen a trailer, barely grazed over the plot summary, wasn’t even sure which language I’d hear as I read the subtitles. 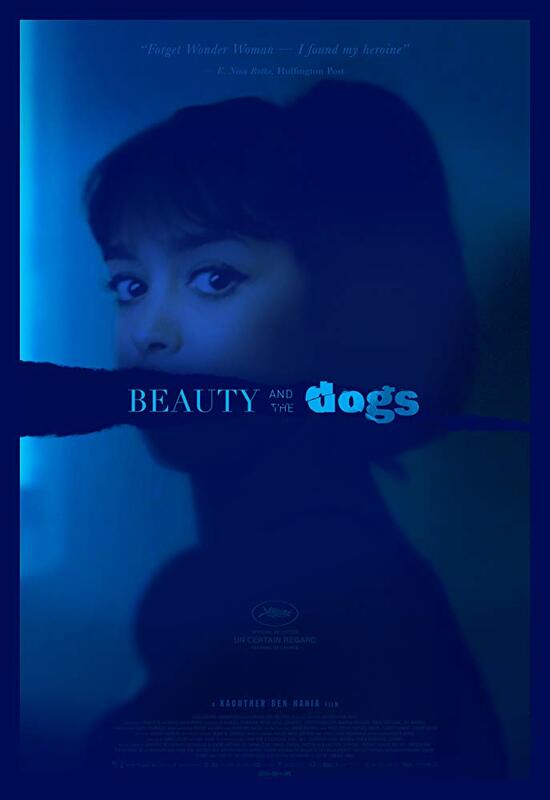 For that very reason, Beauty and the Dogs was an outstanding surprise in two ways: naturally because I went in blindfolded, yet when my eyes came back into focus, what took place on-screen managed to be no less shocking, if not infinitely more daunting than one might expect. And while the script has a few earmarks that go mostly investigated – or perhaps the gaps are cultural lapses I didn’t comprehend as an American – the movie still becomes an important, practically invaluable, physically infuriating tale of guarded and resourceful femininity fending off toxic masculinity. Elevated by some of 2018’s most impressively blocked, carefully choreographed and visionary cinematography from Joham Holmquist, as well as a wary, gut-wrenching lead performance by Mariam Al Ferjani (in one of the best, most challenging feature film debuts I’ve seen in quite some time), director Kaouther Ben Hania does her telling with didactically technical precision and raw vulnerability. Beauty and the Dogs confronts severe systemic problems and intensely personal violations, addresses the relationship between perpetrators and complicit bystanders, and shows that great resolve and inward composure can square off against duplicitous, imposing scare tactics. Through its title alone, Beauty and the Dogs defies the belief that there is strength in numbers, and suggests there’s more strength in personal conviction. This one resonates deeply.